200A current and voltage measurement Hall effect sensor, based on Allegro Hall Sensor ACS758-200U. Voltage range up to 20S (max. 85V) with solder bridge open and up to 7S (max. 33V) with solder bridge closed. Molex CLIK-Mate 1.25mm 4p connector. Compatible with PL BECs, Sensor Hub X2, Sensor Hub X8, and Power-Cubes. Includes CFK enclosure but does not include sensor cable (sensor cables supplied with the BECs). If you want to use your own BEC (4.95-5.05V), also order a 040: Sensor cable. 27.5 x 19.5 x 10.5mm / 22g (without enclosure). 43.5 x 23.0 x 15mm / 27g (with enclosure). Please review the Mauch warranty for returns and replacements. Having accurate calibration values configured in ArduPilot is of paramount importance for the proper computation of battery consumption, as well as the reliability of alerts and failsafes which are critical safety features. Each Sensor Board is individually tested with a flight controller and the calibration values of the specific Sensor Board are determined. The highly accurate calibration values of each Sensor Board is provided in a format that can be directly entered into ArduPilot. Not everybody is willing to go through the steps of properly calibrating their power module. The Sensor Boards remove the need for users to painstakingly perform the calibration steps. 1. In Mission Planner, under INITIAL SETUP >> Optional Hardware >> Battery Monitor, set the “Sensor” to “Other”. 2. Enter the “Voltage divider” value provided with your Sensor Board, then click out of the field to save the value. The calculated “Battery voltage” value should be within a few millivolts of the actual battery voltage. 3. Enter the “Amperes per volt” value provided with your Sensor Board, then click out of the field to save the value. The original 3DR power module and most Atto boards experience voltage drops during hover (0.5-1.5V) caused by the resistance of the connectors and wires. In the Sensor Boards, the voltage drop error is minimized as only the resistance of the positive battery wire is measured. Additionally, the power supply for the BEC is separated and can be connected as close as possible to the battery. This results in more stable voltage/current measurements, accurate to /- 0.5%. Furthermore, the voltage sensor has a filter which reduces the risk of false RTL trigger, which might otherwise happen in very windy conditions due to sudden motor speed up. The maximum output voltage of the sensor board is limited to 3.3V, so there’s no risk of damaging the analog inputs on the flight controller. Each Sensor Board is thoroughly bench tested using MAUCH’s rigorous process. The final QC is a setup with a flight controller (Pixhawk 2.1) and connected to Mission Planner to check the current and voltage calibration values. Do you know any other manufacturer who uses an actual flight controller to test the calibration values of power modules? 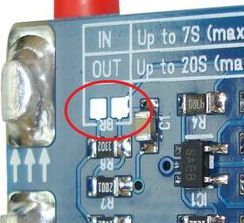 If using a battery up to 7S, you can close the solder bridge on the Sensor Board to achieve more precise measurements at those lower voltages. In this case, use a voltage divider value of 10.0 (the measurement will be fairly accurate) or perform the voltage calibration procedure for ArduPilot. If using a battery of 8S or more, or if you decide not to close the solder bridge, use the pre-calibrated voltage divider value provided with your sensor (around 27). Use double side tape or screw onto the frame by removing the M3 screws and drilling holes into the frame. Reinstall the screws through the frame. The original screws will be too short, so please replace them with longer ones according to the thickness of your frame.